One of our main focuses, along with security and stability, is productivity. Burnouts are very frequent in customer support. One of the main causes of burnouts is doing repetitive routine tasks over and over again. With Jitbit Helpdesk we try to help you automate such tasks or, at least, make them as easy to do as possible. This was one of the original reasons we've created our own helpdesk software. Most of the other apps just give you more stuff to do - more buttons to click, check boxes to check and forms to fill. We try to give you less. If you need more advanced features, you will find them, but we don't shove them in your face during the majority of your work day. This article is an overview of some of the productivity features in Jitbit Helpdesk that will make your job easier. Everything you see on the two main pages - the ticket list and the ticket view - updates in real-time. The data you see is always current. We don't want you to spend your time refreshing the page to see if there are new customer replies. Just open the browser tab and everything is already updated for you. One other thing that works really well with real-time updates is what we call a tech collision detection. Have you ever written a long a tedious reply just to find that another member of your team has already responded to that ticket? Jitbit shows you if the ticket you look at is currently viewed by another agent. This information is also shown in real-time on the main ticket list so you don't even have to waste time clicking on the ticket that is handled by someone else. Speaking of repetitive things. No matter what industry you are in you is going to get repetitive questions. There is absolutely no need to type the same answers over and over again - use canned responses. Canned responses are saved snippets of text that you can insert into your reply with a couple of clicks. They are shared between all techs in your teams so that you do not need to update them for each person individually. The best support ticket is no ticket at all - help your customers help themselves. If you invest some time in filling your Knowledge Base with useful information we will take care of the rest. 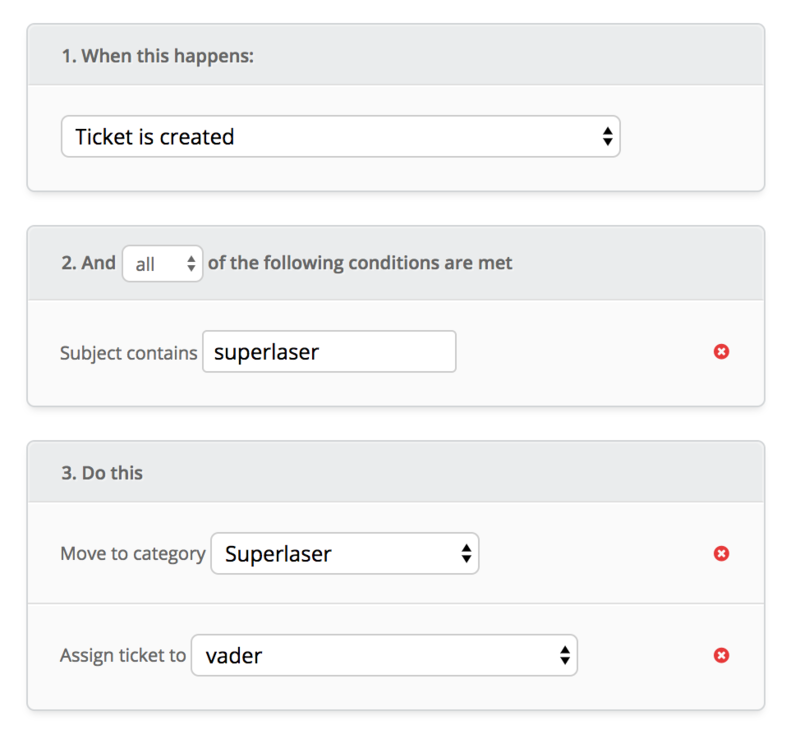 Jitbit Helpdesk analyses text that users enter when submitting new tickets and dynamically suggest relevant KB article. In an ideal situation, they will see the answer before submitting a ticket. Win-win. We do the same thing for techs. When a technician opens a ticket Jitbit will show relevant KB articles if there are any. So again, investing time into keeping your Knowledge Base up to date will pay off big time in the long run. New employee onboarding will be a breeze. You can do a bunch of things here assign technicians, change categories, write replies, even send HTTP request to a third-party server. More than twenty different actions are supported. This is a very flexible system that is designed to take care of anyone's needs. No matter what your business processes look you can find some use in automation rules. These are the major productivity features in Jitbit Helpdesk that will make your days easier. We care about technicians a lot since we know that customer support is a really hard job.